This letter chiefly relates to the difficulties between the Narragansetts and Mohegans, growing out of the dispersion of the Pequots. 1. That there shall be peace between the tribes and "all former injuries and wrongs offered each other remitted and buried." 2. That if further wrongs he committed by either party, they mall not revenge them, but shall appeal to the English, who shall decide between them. If either party refuse to abide by the decision, the English may compel them to do so. 3. The tribes mentioned agree to bring in the chief Sachem of the Pequots; and for the murderers known to have killed the English "they shall as soon as they can possibly take off their heads." 4. Provides for the division of the Pequot prisoners, who “shall no more be called Pequots, but Narragansetts and Mohegans." To his much honored Governor John Winthrop. Much Honored Sir, Through the mercy of the Most High, I am newly returned from a double journey to Connecticut and Plymouth. I shall presume on your wonted love and gentleness to present you with a short relation of what issue it pleased the Lord to produce out of them, especially since your worship’s name was some way engaged in both. 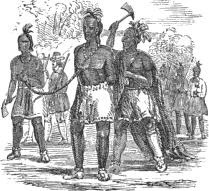 I went up to Connecticut with Miantunnomu, who had a guard of upwards of one hundred and fifty men, and many Sachems, and his wife and children^ with him. By the way (lodging from his house three nights in the woods) we met divers Narragansett men complaining of robbery and violence, which they had sustained from the Pequots and Mohegans in their travel from Connecticut; as also some of the Wunnashowatuckoogs (subject to Canonicus) came to us and advertised, that two days before, about fix hundred and sixty Pequots, Mohegans and their confederates had robbed them, and spoiled about twenty-three fields of corn, and rifled four Narragansett men amongst them; as also that they lay in way and wait to stop Miantunnomue's passage to Connecticut, and divers of them threatened to boil him in the kettle. These tidings being many ways confirmed, my company, Mr. Scott (a Suffolk man) and Mr. Cope, advised our stop and turn back; unto which I also advised the whole company, to prevent bloodshed, resolving to get up to Connecticut by water, hoping there to stop such courses. But Miantunnomu and his council resolved (being then about fifty miles, half-way, on our journey) that not a man mould turn back, resolving rather all to die, keeping strict watch by night, and in dangerous places a guard by day about the Sachems, Miantunnomu and his wife, who kept the path, myself and company always first, and on either fide of the path forty or fifty men to prevent sudden surprises. This was their Indian march fore mentioned. But it pleased the Father of mercies, that (as we since heard) we came not by till two days after the time given out by Miantunnomu, (by reason of staying for me until the Lord's day was over,) as also the Lord sent a rumor of great numbers of the English in company with the Narragansetts, so that we came safe to Connecticut. Being arrived, Uncas had sent messengers that he was lame, and could not come. Mr. Haynes said, it was a lame excuse, and sent earnestly for him, who at last came, and being charged by Mr. Haynes with the late outrages, one of his company said, they were but an hundred men. He said, he was with them, but did not see all that was done, and they did but roast corn, &c. So there being affirmations and negations concerning the numbers of men and the spoil, not having eye-witnesses of our own, that fell, as also many other mutual complaints of rifling each other, which were heard at large to give vent and breathing to both parts. At last we drew them to make hands, Miantunnomu and Uncas; and Miantunnomu invited (twice earnestly) Uncas to sup and dine with him, he and all his company (his men having killed some venison;) but he would not yield, although the magistrates persuaded him also to it. Nausipouck, Puttaquappuonckquame his son, now on Long Island. Nanasquiouwut, Puttaquappuonckquame his brother, at Mohegan. Puppompogs, Safacous his brother, at Mohegan. Attayakitch, at Pequot or Mohegan. These, with the murderers, the magistrates desired to cut off, the rest to divide, and to abolish their names. An inquisition was made; and it was affirmed from Canonicus, that he had not one. Miantunnomu gave in the names of ten or eleven, which were the remainders of near seventy, which at the first subjected themselves, of which I advertised your worship, but all again departed, or never came to him; so that two or three of these he had with him; the rest were at Mohegan and Pequot. Uncas was desired to give in the names of his. He answered, that he knew not their names. He said there were forty on Long Island; and that Juanemo and three Nayantick Sachems had Pequots, and that he himself had but twenty. Thomas Stanton told him and the magistrates, that he dealt very falsely; and it was affirmed by others, that he fetched thirty or forty from Long Island at one time. Then he acknowledged, that he had thirty, but the names he could not give. It pleased the magistrates to request me to send to Nayantick, that the names of their Pequots might be sent to Connecticut; as also to give Uncas ten days to bring in the number and names of his Pequots and their runaways, Mr. Haynes threatening also (in cafe of failing) to fetch them. 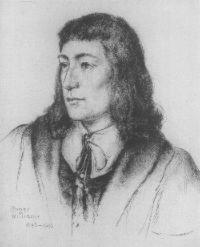 Sir, at Plymouth, it pleased the Lord to force the prisoners to confess, that they all complotted and intended murder; and they were, three of them, (the fourth having escaped, by a pinnace, from Aquedneck,) executed in the presence of the natives who went with me. Our friends confessed, that they received much quickening from your own hand. O that they might also in a case more weighty, wherein they need much, viz. : the standing to their present government and liberties, to which I find them weakly resolved. They have requested me to enquire out a murder five years since committed upon a Plymouth man (as they now hear) by two Narragansett Indians, between Plymouth and Sowwams. I hope (if true) the Lord will difcover it. 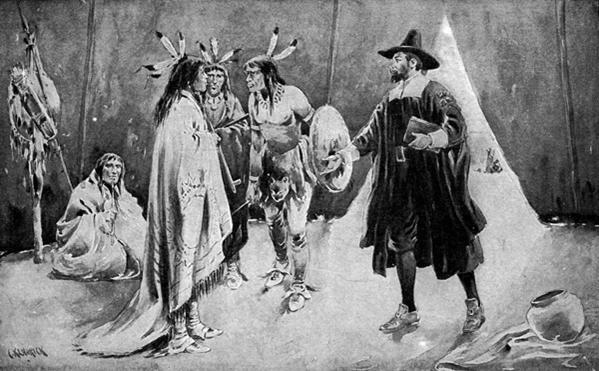 Sir, I understand that there hath been some Englishmen of late come over, who hath told much to Cutmamoquene's Indians (I think Auhaudin) of a great Sachem in England (using the King's name) to whom all the Sachems in this land are and may be nothing, and where his ships may land; and this is much news at present amongst natives. I hope to enquire out the men. Mr. Vane hath also written to Mr. Coddington and others on the island of late, to remove from Boston as speedily as they might, because some evil was ripening, &c. The most holy and mighty One blast all mischievous buds and blossoms, and prepare us for tears in the valley of tears, help you and us to trample on the dunghill of this present world, and to set affections and cast anchor above these heavens and earth, which are reserved for burning. Sir, I hear, that two malicious persons, one I was bold to trouble your worship with not long since,) Joshua Verin, and another yet with us, William Arnold, have most falsely and slanderously (as I hope it shall appear) complotted together (even as Gardiner did against yourselves) many odious accusations in writing. It may be, they may some way come to your loving hand. I presume the end is, to render me odious both to the King's majesty, as also to yourselves. I shall request humbly your wonted love and gentleness (if it come to your worship’s hand) to help me with the fight of it, and I am confident yourself shall be the judge of the notorious wickedness and malicious falsehoods therein, and that there hath not part aught from me, either concerning the maintaining of our liberties in this land, or any difference with yourselves, which shall not manifest loyalty's reverence, modestly and tender affection. Much honoured Sir, -- Your Runnawayes (as I before surmised) are at Monhiggin, & the Sachims daughter is married to the Sachim Onkas. I know that the match hath bene long desire (although the Sachim hath 5 or 6 wives already) which makes me feare that all Indian meanes will not reach your just desires. May you please to rest a little, for Miantunnomu (as he pretends out of love & respect to your person) is very diligent about a peaceable returne of them, that he may bring them with him, & as gone to Qunnihticut, so that a little patience is requisite. Sir, this you may please to signifie to your much honored brother Mr. Gouernour, that this business only hinders Miantunnomues coming. He is (not satisfied but) persuaded to trust to interpreters whom he feares to trust, & to come without myselfe. As allso may you please to understand that the Nayantaquite Sachims still refusing to yeald up any of those Pequts to death to whome they had promised life; our friends to Connecticut (as I have heard by two letters from Thomas Stanton) intend present revenge upon them. 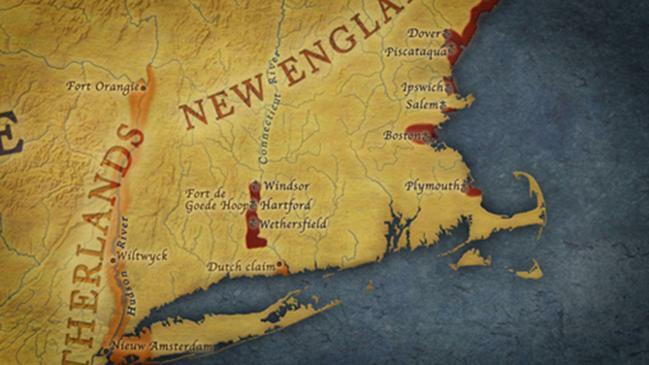 Caunounicus & Miantunnomu still persuade (to mine owne knowledge) the Sachims at last to be wise, & yield up their Pequots, but in vaine, for the Nayantic Sachems resolve that for so many lives as are taken away by the English, or the Monhiggins & Pequts with them, they will take revenge upon Mr. Throckmorton at Prudence or Mr. Coddington or Providence, or elsewhere. I have dealt with Caunounicus and Miantunnomu to desert the Nayantics in this business. They answer they would if they had shed the blood of the English, but as they are their brethren, so they never hurt the English, but joined with them against the Pequots only they have been greedie upon the prey against the English mind; lastly they say the English partialitie to all the Pequts at Monhiggin is so great, & the consequences so grievous upon the abuse of the English love, that all their arguments returne back(which they use to the Nayantic Sachims) as arrows from a stone wall. Thomas Stanton informed me of another cause of warr upon the Nayantaquits, viz: Wequash affirmes that one of the petie Sachims of Nayantaquit was aboard Mr. Oldhams pinnace, & that some goods & gold are at Nayantaquit. Gold I never heard of, but the pinnace, skiff & other luggage & small particulars I had word of at first, which were (by reason of distance) let alone; & in case that any one of the Sachims or more knew of Mr. Oldham’s death, & that due evidence be found, I yet doubt (now since the coming of the Lord Jesus & the period of the National Church,) whether any other use of warr & arms be lawfull to the professors of the Lord Jesus, but in execution of justice upon malefactors at home; or preserving of life & lives in defencive warr as was upon the Pequots.